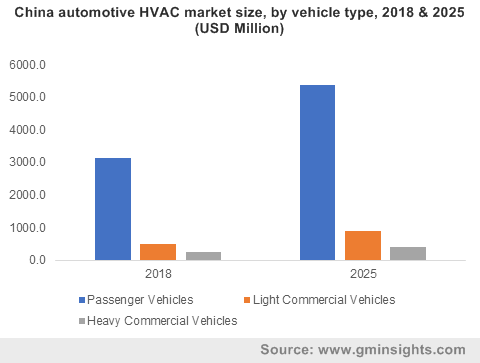 Automotive HVAC Market size estimated at over USD 16 billion in 2018 and will grow at 6% CAGR from 2019 to 2025. The flourishing demand in automotive sector globally as a result of the growing disposable income is driving the automotive HVAC market size. Consumers are increasingly spending on more comfort and luxury features in vehicles, propelling OEMs to integrate high-quality climate control systems. Manufacturers are investing in R&D to offer product differentiation in their products such as compact and lightweight HVAC systems. For instance, Denso has developed a novel COA HVAC based on a new blower structure that offers a reduction in heat required by the system by 30%, reducing size and power consumption by 20%. This will enable the company to offer HVAC systems to its clients, providing both environmental performance and energy efficiency. In addition, the growing concerns in consumers regarding indoor air quality are further creating several growth prospects for the market. One of the factors that challenges the automotive HVAC market is the noise generated by these systems inside the car cabin, inducing passenger discomfort. Clattering noises by these systems are produced due to the interactions between HVAC components and airflow. Passive absorbers on HVAC body and ducts are being used by HVAC suppliers on current designs to reduce system noises during its operation, providing comfort inside the car cabin. Automatic systems will lead the automotive HVAC market with over 65% share in 2018. Increased demand for high cabin comfort and ease of operation is one of the major factors contributing towards the industry. demand. Automatic systems require temperature and humidity sensors to be placed inside the vehicle cabin and adjust the temperature according to the passenger needs. Manual systems are projected to grow at a CAGR of around 3% in the market as they are commonly installed in low specification budget vehicles. Manual air conditioners allow users to determine the amount of airflow through physical knobs and dials. They only enable the passengers to set the airflow at limited controls such as low, medium, and high airflow. The automotive HVAC market is projected to witness the high growth in the passenger vehicles segment due to factors such as the increasing demand for cars in developing nations, high growth of electric vehicles, and stringent regulations being laid by governments in Europe and the U.S. for climate control. There is a demand for swash plate compressors in passenger vehicles due to the high efficiency of these systems offered at a low cost. These systems are preferred by the majority of HVAC system suppliers, augmenting the market. Commercial vehicles are experiencing a steady growth in the global market owing to the growing concerns regarding the indoor air quality for truckers. These vehicles are increasingly deploying efficient HVAC systems due to the requirement for efficient fuel consumption and thermal comfort for drivers. Moreover, the increased consumption of commercial vehicles owing to the need for transportation operation across all industry verticals also creates several market growth opportunities. The compressor market is projected to witness the highest growth over the forecast period in the automotive HVAC market, growing at a CAGR of over 6.5%. These systems are central to HVAC systems and operate by absorbing refrigerant vapor from suction line and compressing it to vapors. These are responsible for generating the flow of refrigerants and remove latent heat. Companies are rigorously improving their product offerings to meet the growing energy standards and low-GWP refrigerant regulations, augmenting industry size. The receiver/drier segment will grow moderately due to factors such as its capability to store extra refrigerants during low cooling demand and are commonly located in the high-pressure section of the system. In addition, they filter out contaminants inside the A/C system and absorb moisture through the drier that have gotten during assembly, service or assembly. 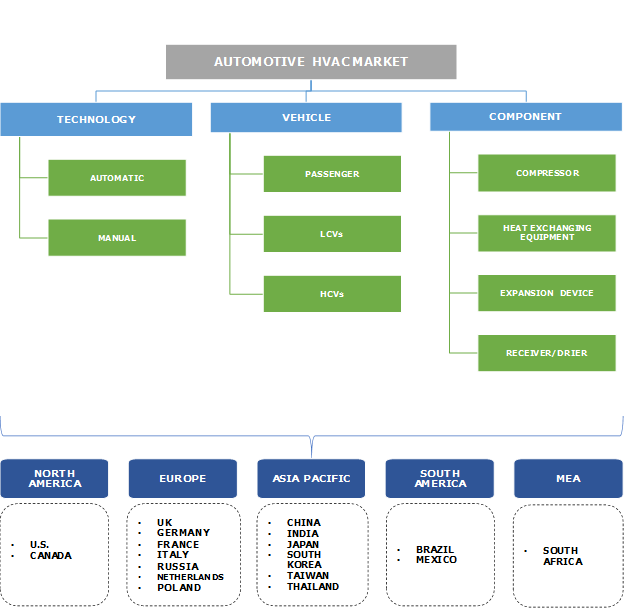 Asia Pacific is the leading automotive HVAC market due to increasing motor vehicle production in the region. China is one of the largest markets and contributes significantly to the demand for these systems. In 2017, China produced over 24 million motor vehicles in 2017, which accounts for over 45% of the global production. Government initiatives and support in countries including China and India to revive the automotive industry further contributing towards industry growth. The increasing demand for passenger vehicles from India as a result of improving standards of living is also contributing towards market growth in the region. Consumers are aligning toward high specification vehicles that offer par comfort features. In addition, there is an upsurge in vehicle production by foreign companies in countries including Thailand and Malaysia. The key players in the automotive HVAC market include Valeo, Denso, Mahle Group, and Hanon Systems. Sanden Holdings Corporation, Japan Climate Systems Corporation, Keihin Corporation, and Calsonic Kansei Corporation are among few others. These companies focus on bringing innovative products in the industry, catering to the growing demand for energy-efficient systems that offer maximum fuel efficiency. Suppliers and automakers collaborate to design and implement these systems for the vehicles based on parameters such as car design, engine capacity, cabin volume, etc. In July 2017, Sanden introduced the first eco-friendly CO2 refrigerant compressor, which has been designed for passenger cars. Sanden supplied these compressors to Daimler AG in response to the growing environmental regulations regarding global warming and ozone depletion. The HVAC is a compact and multifaceted system comprising many components such as filters, thermal exchangers, fans, etc., that permit airflow circulation to vehicle cabins. The market will grow at a modest rate over the future owing to the increasing demand for comfort features such as demand for high quality air conditioners, infotainment systems, noise free systems etc. by passengers. HVAC systems have now become integral to passenger vehicles and are also being widely integrated by light commercial vehicle manufacturers and heavy trucks manufacturers. Different HVAC suppliers offer different system designs according to vehicle interior components, which will determine the impact of potential design changes on system performance.